End your day with a splash! When you come home to this modern 3 bedroom Bay Ridge home that has a Private yard with a decked in swimming pool you’ll love to unwind in. As you enter the front door of this home, you’ll love its open and airy design with cathedral ceilings, skylights, spacious living/dining room, an Eat-in-Kitchen perfect for family gatherings, and a convenient powder room. The 2nd floor features 3 bedrooms, plenty of closet space & 1 full bathroom with Jacuzzi tub. A full finished basement with tiled floors, high ceilings, laundry area, modern bathroom & separate entrance completes the interior of this home. Some other features include: central vacuum, ductless AC units, high hat lighting, Peach Tree Windows, a detached one car garage & much More! 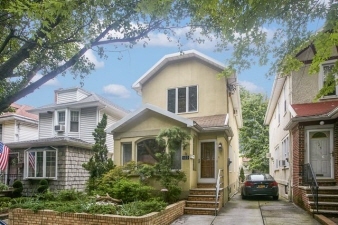 Don’t miss out on this beautiful home located on a lovely, quiet & convenient Bay Ridge block.